Limiting the unnecessary use of cars in cities is essential to making them safer and more sustainable, says Claudio Sarmiento. The more cars on the road, the more challenges a city faces. Developing countries like Mexico have experienced increased car ownership in recent years, as much as 23 per cent annually since 1995. As these car-owners take more trips, there are more road fatalities, traffic congestion, longer commuting times, and air pollution. Despite these risks, most cities are decidedly car-centric and rely on private vehicles for almost all urban trips, whether or not a car is the most efficient or convenient option. Creating safer, more sustainable cities means designing them to move people, not cars. One way to achieve this goal is transport demand management. 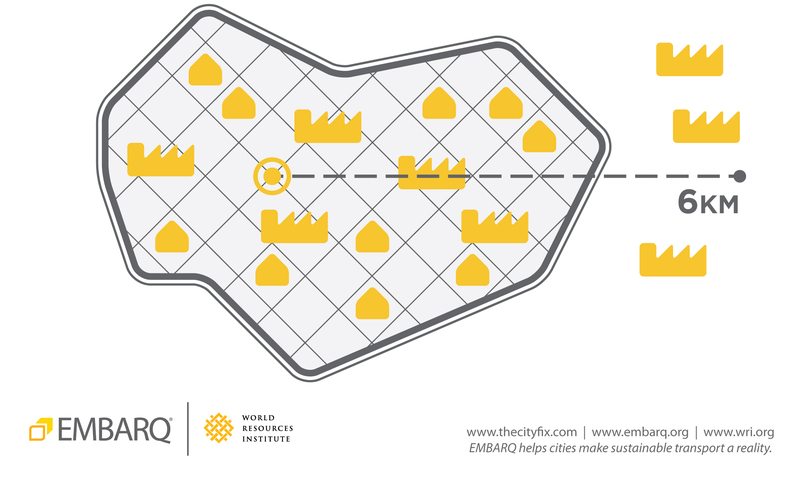 What is transport demand management? Transport demand management refers to a set of strategies that maximize urban mobility by limiting the unnecessary use of private cars. These strategies recognize that cars will always play a role in the make-up of a city, and work to manage car use by promoting more sustainable and integrated transport options. Furthermore, they make streets safer for all commuters—drivers, cyclists, and pedestrians. To get anywhere in a city, travelers decide what mode of transport to use, which route to take, and which is the most convenient way to go. Transport demand management focuses on each of these links within a city’s transport system, cutting car-dependence and making sustainable transport more attractive. Car-oriented cities are sprawling and dispersed, leaving a disproportionate amount of space for cars at the expense of other modes of transport. Even with carpool lanes and car-sharing schemes, which use road space more efficiently, private cars still gridlock city streets. For example, it takes up to 50 times more road space for cars to carry the same number of people as the average public transport vehicle in Mexico City, based on the city’s average occupancy of 1.21 passengers per car. But without viable alternatives, commuters are left with few options beyond the car. The availability of public transport that connects people’s homes to schools or employment centers can make for a better, shorter commute and reduce traffic congestion, as everyday commutes make up nearly 30 per cent of total vehicle traffic in North American cities. Alternative mobility options such as walking and cycling become more feasible when job opportunities are closer to residential areas. Commuting by car can be avoided by providing “home office” and “live-work” options. Graphic by EMBARQ. Transport demand management can improve city-dwellers’ quality of life, but only if local governments, urban planners, and other stakeholders apply these strategies in conjunction with complementary urban mobility strategies. Cars can be an efficient piece of urban transportation systems, but only if integrated with more sustainable modes like bus rapid transit (BRT), metro, and active transport. Commuters can easily drive to a designated parking lot and take public transport or walk to their destinations. These park-and-ride or park-and-walk programs have proven to be successful before sporting events such as the 2011 Pan-American Olympics in Guadalajara, where only 10 per cent of attendees parked outside the main stadium. Street design is also a key factor. Car-oriented cities are designed to move vehicles at high speeds. While this makes motorized mobility convenient, it also increases the risk of traffic crashes, inhibits access to other means of transport, and endangers pedestrians and cyclists. Parking lots can be put to better use through temporary conversion into a productive space, like a public market. The city of San Francisco’s Pavement to Parks Program, for example, retrofits parking spaces into public spaces. Graphic by EMBARQ. 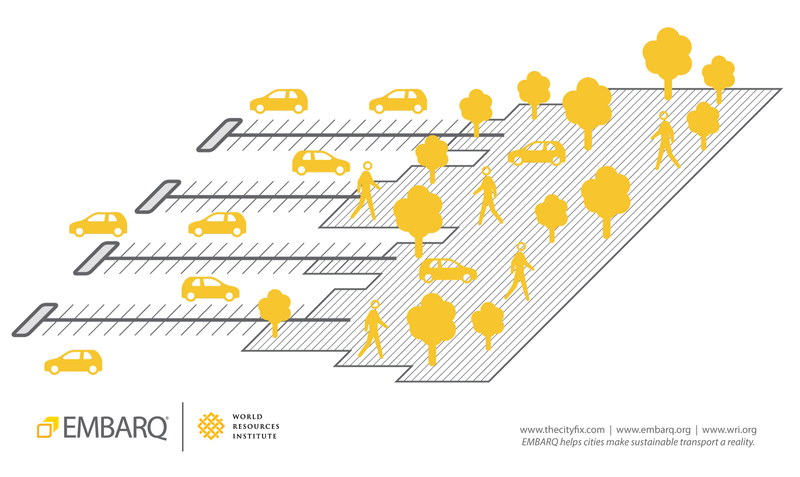 People-oriented cities recognize the car as part of a larger sustainable mobility strategy, and must therefore provide solutions to adequately manage car use. Transport demand management can improve city-dwellers’ quality of life, but only if local governments, urban planners, and other stakeholders apply these strategies in conjunction with complementary urban mobility strategies. In the end, the smartest city is not the one that eliminates cars, but the one that can integrate them into a sustainable network of urban mobility options. Claudio Sarmiento currently works in Urban Development at EMBARQ Mexico. This post originally appeared on the World Resources Institute’s Insights blog.